The Third Edge of the Sword: What's My Goal Again? The 2014-2015 season is winding down, and since the Oilers are such a humiliating disaster that they can't even figure out how to lose properly, I figure now's a great time to change the subject. So, uh, hey, how about that goal differential? Goal differential, for those who don't know already, is just the difference between goals-for and goals-against. Before Corsi and Fenwick were all the rage, it was how amateur sabremeticians in the hockey world evaluated whether or not a team was getting the standings points it "deserved". In general, a high goal differential spells success. 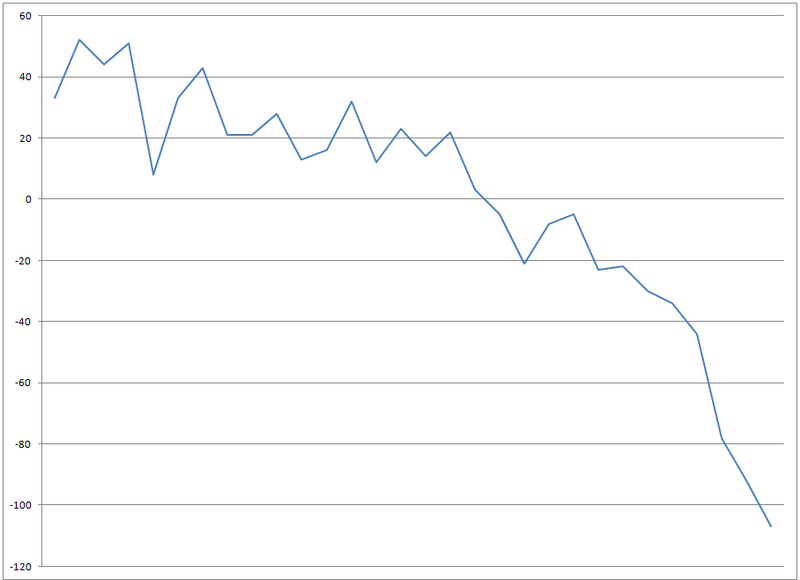 Here's a quick chart of the goal differential per team. The teams are arranged based on their current point in the league standings. So having said that, let's (temporarily) ignore the standings and just look at goal differential as if that was the be-all and end-all of the hockey world. These teams fairly nicely break up into groups, so let's take a look at them. This group has some of the top ranked teams in the league with the NY Rangers (2, +52), Tampa (4,+51), St. Louis (3,+44) and Chicago (7,+43). 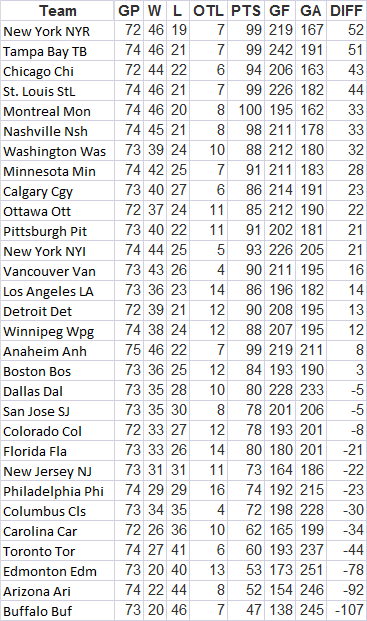 You may notice that there's a decent dropoff between the top two and bottom two teams within this tier as well. The Rangers seem to have come out of nowhere to reclaim top spot in the standings, and now we see why. St. Louis and Chicago are the midwest powerhouses, and Tampa Bay has been putting together a solid little run partly due to their insanely good home record: their the only team to have 30 home wins so far. Our second group features Montreal (1,+33), Nashville (6,+33), Washington (13,+32) and Minnesota (10,+28). Montreal has the freakish Carey Price to thank for their win-loss record, and we see another piece of evidence that the first overall team isn't really that first overall (their Fenwick-close, of course, being the main one). Nashville had that amazing start to the season that's cooled off but still left them as a top team), and both Washington and Minnesota score rather well here given their position in the standings -- particularly Washington in the weakling eastern division. Minnesota, of course, has Devan Dubnyk to thank for their ability to sneak up with a mediocre differential. This group features Calgary (15,+23), Ottawa (17,+22), Brooklyn (8,+21), and Pittsburgh (9,+21). With the exception of Calgary, the freaky weird nobody believes they belong here band of misfits, these numbers you think should have these guys nimbly holding onto a playoff spot, which of course these all are. Group D brings us some of the 2014-2015 NHL misfits. Let's introduce Vancouver (12,+16), LA (16,+14), Detroit (11,+13), Winnipeg (14,+12), and Anaheim (5,+8). Vancouver and Detroit have been sorta-strong performers in their conferences all year with Vancouver and Calgary oddly doing a dance together in the standings since about November 20th. Detroit and Winnipeg are the strong "whoa, who knew they would be this going" teams for their respective conferences, and here's the LA Kings pretending to run with the big boys as they looked poised to, beleive it or not, actually miss the playoffs. Add in the other weirdo California team in Anaheim, who has parlayed a historic run of skiluk (a word I just made up because nobody is sure if its skill or luck) involving their record in one-goal games. Group E: Wait, you are supposed to score more than the other team? Next up are Boston (18,+3), Dallas (19,-5), San Jose (22,-5), and Colorado (21,-8). All of them are pretty close to even-steven in the goal differential department, and all of them are having what could charitably be described as disappointing seasons. Boston and Dallas were expected to run roughshod over their competition this season, and that just hasn't panned out mostly due to troubles between the pipes. The other other weirdo California team, the perpetually Captain-less San Jose Sharks, need to win six of their next nine just to pass where Winnipeg holds down the last wild card spot today. Colorado, meanwhile, continues the "no, Patrick Roy isn't the greatest coach in history" season in earnest. Okay, now we're really descending rapidly into the basement. After Colorado comes a 13 goal dropoff to our next group which is Florida (20,-21), New Jersey (24,-22), Philadelphia (23,-23), Columbus (25,-30), and Carolina (-26,-34). All of these eastern conference teams are just flat out bad, and in need of serious repairs going into next season. Florida didn't quite get the performance out of Roberto Luongo they had hoped for: he sits ranked 14th in goaltenders SV% which isn't what you pay his contract out for. New Jersey, meanwhile, is getting everything out of Lou's old teammate Corey Schneider† they asked for (he's 3rd in SV% behind Carey Price and Devan *spit* Dubnyk). Now if only they could score a goal from time to time. † Are you allowed to refer to one of these goalies now without mentioning the other one? I don't think so: regardless, their stories match up pretty well. This group has only one member: the Toronto Maple Leafs (27,-44). Their goal differential is as far away from Boston's as Boston's is from the New York Rangers. Again, only one member in this group: the goal differntial difference between the Edmonton Oilers (28,-78) and the Winnipeg Jets is so huge, that if Toronto had that extra 90 goals on the season they'd be third in the league behind New York and Tampa Bay. And they keep getting even worse! Welcome to Phoenix (29,-92), the other team to give away Devan Dubnyk, and it shows. Finally, the group where Group I seems a dreamy pie-in-the-sky achievement. Buffalo (30,-107) is further behind Toronto than Dallas is behind Minnesota and Calgary combined. Buffalo is on par to have a -120 goal differential by the end of the season. The bottom of the league doesn't break into categories easily, since the distances just get more and more vast. But here Buffalo sits. Enjoy either McDavid or Eichel, my friends. You totally deserve it.